Rushlift Ltd has secured a national deal to supply JP Corry, Northern Ireland’s largest builders merchant with specialist equipment from forklift manufactures Doosan and Combilift. A highly respected name in Ireland, with a 140 year history providing timber and building supplies from around the world, JP Corry has already received over 40 new Doosan and Combilift trucks across 17 branches. The 10-year supply contract was developed by Rushlift national account manager Matt Turner who travelled to each site, assessing each branch’s individual requirements and recommending new methods of working. Because of his expertise and knowledge, Matt was able to identify a tailor made solution for JP Corry to improve productivity and reduce lifetime costs. JP Corry’s operations director, Richard Whiteside, said: “We have been greatly impressed with how Matt and the Rushlift team have gone about this process. They have taken great care and diligence in putting together a package that is catered towards us getting maximum return on investments, and reducing our operational costs. The introduction of the new Combilift equipment will enable, faster, increased productivity for JP Corry’s business. The Combilift is designed to handle long-loads safely, by eliminating the need to travel with loads lifted high; the units provide greater stability and safer product handling. The unique 4-way steering system allows the units to travel sideways with long load resulting in less product damage, safer handling for staff and the potential to save on space. Doosan will be providing trucks from its award winning Pro-5 range. A world leading value forklift brand with a reputation for simple, powerful products designed for UK and European markets Doosan’s trucks are tough, reliable, simple to operate and economical to run. The Doosan trucks come with numerous features including; high performance engines, operator sensing systems and hydrostatic steering. 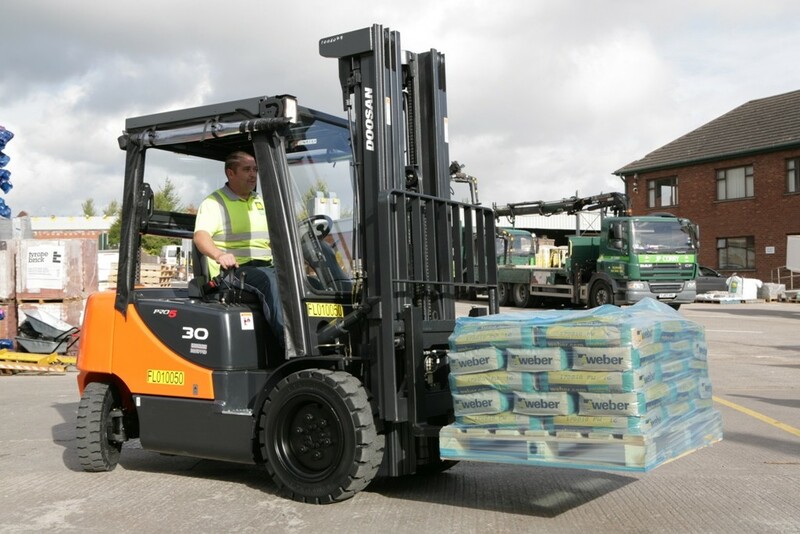 These are all designed to boost productivity, efficiency and provide a safer working environment demonstrating that a Doosan makes a worthy addition to any forklift fleet. JP Corry prides itself on being a complete building supplier to both traders and the general public. Supplying everything needed for building projects, from the foundations to finishing touches, the company’s approach has earned them the coveted Builders Merchant of the Year Award at the 2010 Octabuild Northern Ireland Builders Merchant Awards. Rushlift is a leading provider of innovative materials handling solutions, with over 100 mobile engineers servicing customers from Aberdeen to Cornwall. As part of the Specialist Hire Group, Rushlift has experienced phenomenal growth over the past five years and was recently voted one of the UK’s fastest growing companies.